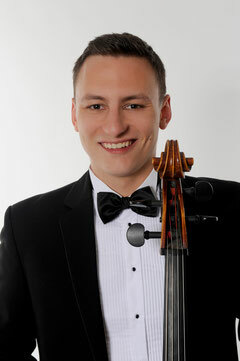 Tomasz - cello - daroch-trios Jimdo-Page! TOMASZ DAROCH was born into an artistic family on June 15th, 1989 in Lodz in Poland. In 2011 he graduated, receiving a diploma with distinction from the Staatliche Hochschule für Musik und Darstellende Kunst in Mannheim, Germany in the class of Prof. Michael Flaksman and Jelena Ocic-Flaksman. and parallel he is studying at the Leopold-Mozart-Zentrum der Universität Augsburg in Germany in the cello class of Prof. Julius Berger. special prize at the „Grand Prix Emanuel Feuermann 2006” in Berlin, the 1st Prize at the International Music Talent Competition in Oldenburg in Germany. Baden-Württemberg, Lions Club and Menuhin Live Music in Germany. In 2003 he made his debut with the Arthur Rubinstein Philharmonic Orchestra in Lodz. Since then he has performed as a soloist with such orchestras as the Polish Radio Symphony Orchestra, the ’’Amadeus’’ Chamber Orchestra, Sinfonia Varsovia, Sinfonietta Cracovia, Warsaw Philharmonic Symphony Orchestra and Heidelberger Philharmoniker. Vladimir Spivakov during the gala concert of the 3rd ’’Rising Stars at the Kremlin’’ in Moscow international festival. The artist performs also as a chamber musician in a family piano trio, the ’’Daroch Trio’’. He has recorded for Polish Radio and Television and German and French radios such as NDR Kultur, SWR, BRKlassik and Espace 2.